Do you faithfully carve out a percentage of your income to donate to charities? There are a number of compelling reasons why people do this. Most would like to see a “better world”. Sharing the wealth is one way to achieve this. Charitable giving is a very personal and private act of kindness. Julia states she feels privileged to have acquired a good education which landed her a good job with a good salary. Her interview on CBC Radio Show “Out in the Open” is fascinating as she addresses the questions and ponders others’ concerns about their extravagant generosity. You can click here and listen to this podcast. A change in our perspectives about the things that really matter was mentioned in a previous blog, When We Have So Much. Terry Aberhart, CEO of Aberhart Farms Inc. and Sure Growth Technologies Inc. (an agronomic consulting company), shared his experience on a trip to Ethiopia. I asked you then to imagine going without food, clean water to drink or bathe, and medication to treat a curable ailment. I believe most would find this unbearable because we have never lived in this kind of environment. Sometimes role playing isn’t a bad thing when we get too comfortable in our day-to-day lives. I often think about what would happen if my life drastically changed, and I was living in poverty, and looking to the food bank for my daily meal. What if I had no shoes to wear? What if I had to sleep on a park bench? These role-playing scenarios sound like a bad dream but there are people who live this daily. We can empathize with other people who are less fortunate than we are from a health perspective. Every year, the first weekend in March, the Kinsmen Telemiracle Foundation hosts a 20-hour telethon to raise money for people who require special needs equipment and access to medical treatments. The generosity tugs at your heart strings and brings tears to your eyes as you watch the dollars roll in and the words echo the message, “Which way are we going?” The only answer is “Higher”. This year was no exception. The Regina Leader Post headlines Telemiracle Smashes Record with more than $7.1 million in donations. The sum is an accumulation of both small and large donations. The largest donation ever was a bequest of $1.5 million from the late Dr. Philip Thacker, Professor Emeritus of the University of Saskatchewan and a Kinsmen member. Peoples’ compelling stories inspire others to donate and raise money in countless ways. Philanthropists have their personal reasons for giving. In a rare interview for the magazine, Farming for Tomorrow, Mr. Jimmy Pattison said “The best thing that ever happened to me was that I had no money.” Today Mr. Pattison is patriarch to one of the country’s largest private companies – the Jim Pattison Group (JPG). Reading through the article, you learn quickly that he attributes his success to good values, honesty, integrity, and hard work. He has lived and strived through challenges and opportunities which make him grateful for the success he has achieved. Now he lavishly donates his money primarily to the health-care sector. The new Children’s Hospital of Saskatchewan in Saskatoon is one of the fortunate recipients of Mr. Pattison’s generosity. Last May, he presented a donation of $50 million towards the facility. I am not entirely convinced that people donate money primarily to receive tax credits. From a financial perspective, this is certainly an incentive. Canada Revenue Agency rewards you for your generosity. If you have taxes owing, your tax credits are like gift certificates to offset your tax bill. The higher the amount of donations, the greater the tax incentive will be when you file your tax return. If you are limited to the amount you can donate in any given year, then you might choose to claim your donations together in one year. You are allowed to carry forward any donations in any of the next five years. A lower tax rate is applied for donations of $200 and less; and a higher rate for donations over $200 for any given year. Here is the link to the federal and individual provincial donation tax credits. Using this donation tax credit calculator is one way to determine your tax credit entitlement for your province of residency. The following math illustrates the credit for a Saskatchewan resident who has contributed $1,000 in donations. $262 is their total federal tax credit. This Saskatchewan resident has a combined federal and provincial tax credit for 2017 of $404 ($262 + $142). Regardless of the amount of any donation, it’s the contribution that matters. 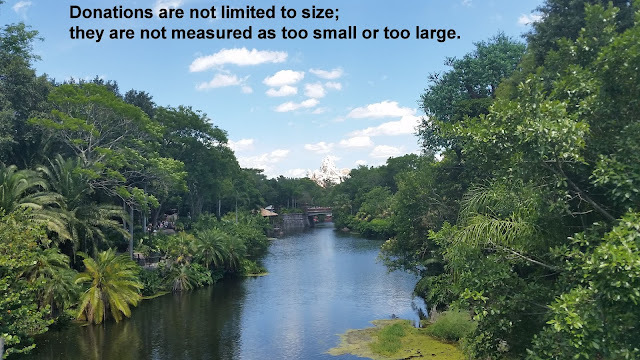 Donations are not limited to size; they are not measured as too small or too large. In the end, the accumulated dollars create and impact a better world. Let’s all keep on giving whatever amount we can to a beneficial cause. Most people love a good reality show but only if it turns out well. We occasionally watch a clip when an accident occurs and the person escapes grave injury. They are able to get up and walk away. The towering poplar and maple trees’ branches lean over the farm buildings. When the rain drips down from the leaves, the shingles deteriorate. When the leaves fall and remain on the roof, even more damage occurs. One day, the farmer evaluates the situation. “A chain saw and ladder will fix this problem,” he thinks. The ladder is cautiously propped up against the tallest maple tree. After precise calculation, he determines the branch that needs to be cut. There’s only one problem: he miscalculates and the law of physics prevails. The ladder falls to the north; the chain saw to the south, and the farmer and the ladder bounce onto the ground below. “This is going to hurt!” is my husband’s first thought when he comes to terms with what just occurred. He’s winded and cracks a couple of ribs. My husband is generally not accident prone. He doesn’t usually get caught in situations like this but sometimes an accident just happens by accident. That’s reality. The unknown in his situation is the “what if”. Being self-employed and working on your own comes with a disadvantage. You are the sole-proprietor and key operator of your farm business. 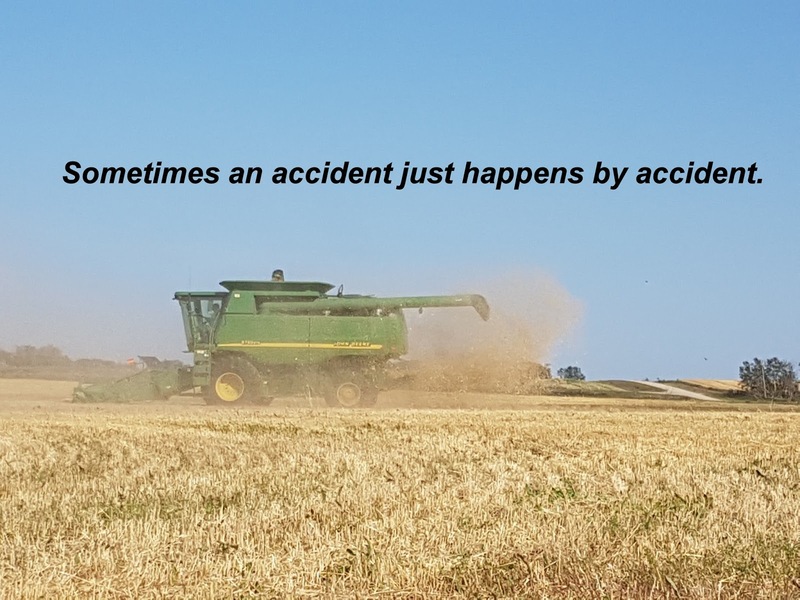 You don’t have the privilege to phone your supervisor, tell him you are injured, expect someone to step into your farmer boots, and take over during a lengthy recovery. The reality is present in any sole proprietorship where there is limited amount of excess cash for medical expenses and hired help. The value of your business is invested in the assets, the equipment, buildings and land. You can see the assets but cannot and do not want to liquidate them. This is when an injection of insurance money helps fund, at the very least, the health care expenses while one recovers. Think about it. Any unexpected debilitating illness or an accident could limit your activity and warrant the need for long-term care insurance at any age. I often recognize there’s a “push-back” to insurance. Fighting your financial battles can be done by carefully evaluating your own personal situation and the associated risks. How many types of insurance do I need? How much can I afford to pay for the coverage? When you face the decision of funding your health care costs, you can choose to self-fund, share the risk, or transfer the risk. Sun Life Financial describes these choices best in this brochure, A Health Conversation featuring Long Term Care Insurance. A. Self-funding means to allocate a portion of existing assets into a “health fund”. This approach requires discipline and risks underestimating who will need care, when care will begin, how long it will last, and how much it will cost. B. Share the risk means to self-fund initial care and transfer the risk of a catastrophic need to long term care insurance. C. Transfer the risk to insurance means that all risk of an unexpected illness or need for care is transferred to long term care insurance or critical illness insurance if the individual is still in good health. My Number #1 concern for any aging couple is when their situation changes, where one spouse is required to live in a private care home while the other continues to live in their home. Essentially, the couple’s total lifestyle costs may have doubled. They are managing and juggling two homes: the expense of private health care and the expense of home ownership (utility bills, insurance, taxes, and others). They are doing so with the same retirement income they had when they were living under the same roof. I totally agree you can’t be fully insured against every risk. We have many different kinds of insurance: life, disability, property, and medical health insurance. Now I am inviting you to consider an additional kind of insurance, long-term care insurance. In every insurance circumstance, you are able to negotiate how much risk you are willing to assume when you self-insure (use your money) and how much premium you can afford when you share the risk with the insurance company. My husband’s tree incident triggered our decision to get long-term care insurance. When he applied, he chose a five-year benefit period. We know this will buy us “time” in any catastrophic event to determine whether his health will improve so he could continue to farm or whether he will have to “pack it in and call it quits.” You could say this insurance policy gives us time to make the right decision without any added financial pressure. The other feature we appreciate is “The return of premium on death benefit”. No one likes the thought of spending money (or should I say ‘wasting money’) on something they may never benefit from using. The thought of a death occurring without the opportunity to take advantage of this coverage may cross many peoples’ minds. For a slightly higher cost, this feature is an add-on which ensures the insurance company will return the premiums if the insured person dies while the policy is in effect. Granted, you personally wouldn’t benefit from the money. The premium money goes to the estate likened to money sitting in a savings account. 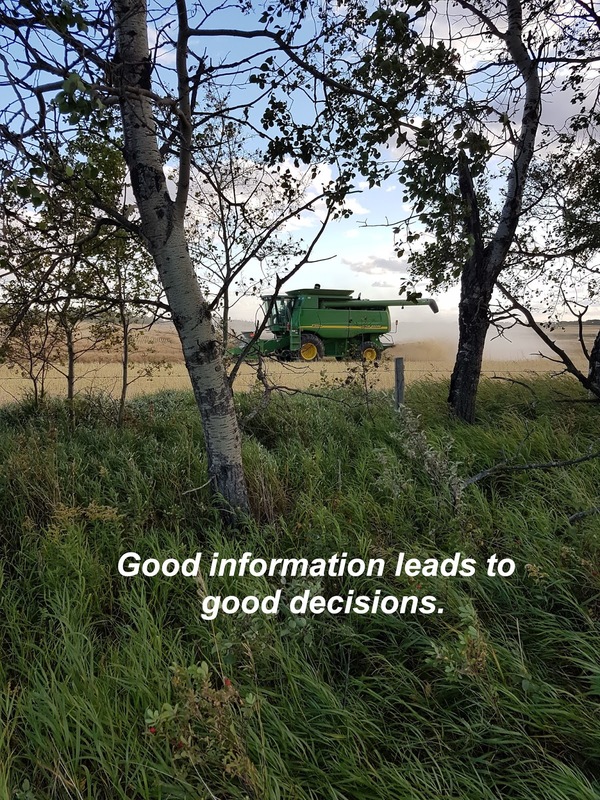 I am a firm believer that good information leads to good decisions. Making the time for a heart-to-heart conversation with your trusted insurance advisor is the only way to receive good information. If you don’t have an advisor, ask for recommendations from your family and friends. You could interview insurance advisors. You are like an employer seeking someone to work on your behalf. You must understand the information they are providing to you. You should feel comfortable with their recommendations. As a CERTIFIED FINANCIAL PLANNER® professional, I don’t sell insurance but I do know its importance in a well-constructed financial plan. Insurance is part of a wealth protection strategy and the premium should never be viewed as an “expense.” I don’t have a preference for any particular insurance company. They all provide the same kind of products with slightly different features and premiums. To learn more about long term care insurance, click this link, to access a guide provided by the Canadian Life and Health Insurance Association (CLHIA). You may also watch this “Learn and Plan” video produced by Sun Life Financial. There is no shortage of information, only a shortage of time to sort and sift all of it. Please make the time to discover the ideal fit for your financial needs.